When you walk into the Great Room, the beauty of the beams just takes your breath away. The X-shaped scissor beams of recycled Douglas fir with inlays of redwood and decorative carvings pull your eyes immediately to the room’s vaulted ceiling. Only after that do you notice the fabulous window views south to Navajo Lake. Finally, your attention turns to the blend of woods within the room—not just the beams, but the cabinets, doors, trim, light sconces and frames for upholstered furniture. Outside the windows, I am surrounded by wood decks and the vertical siding of the house is visible. All are of wonderful wood—all shades, all kinds of finishes—and all is recycled—wood salvaged from old factories, barns and buildings of all sorts. A walk into the bedroom shows visible posts, beams, even ceiling planks…all recycled. The outside of the house shows beams and supports of recycled lumber, and tree trunks and branches, still in the gnarled and twisted shapes in which they have grown. As if that weren’t enough, a tour of the garage shows a roof supported by a tree trunk wider than my arm can reach around. What a lovely place to live, and what an advertisement of the skill of the timberwright! This is the home of one of the owners of San Juan Timberwrights, Inc., a business started when the owners first moved to Pagosa Springs in 1986. The business now has workshops in both Arboles and Norwood, near Telluride. Owners, and brothers-in-law, Mike and Doug were builders of conventional stick-built homes when they became inspired to try timber framing. They started by building a family home in Pagosa Springs and have grown and expanded their business, building primarily in Pagosa Springs, Durango, Telluride and Aspen. They have built frames for homes from 1,000 to more than 10,000 square feet. Although both owners are civil engineers and were already experienced builders of stick-built conventional homes, they now specialize in timber frame homes because they “love the wood and love the craft.” And because of the demand for timber frames, their business’ staff has grown from just the two of them in 1986 to 16 people today. In a further step, since about 1992 San Juan Timberwrights has worked primarily in recycled wood, although new wood can be used if the customer prefers. Why do they prefer to use recycled wood? First, these fine old woods work best in a dry climate such as ours because the are already fully dry after being part of other buildings for 50-100 years or more. They make a better quality frame since no further shrinking and cracking should occur. Second, using recycled wood means that no new trees need to be cut, saving a few of our precious big, old trees. San Juan Timberwrights’ prefers to use old Douglas fir lumber, mostly from the Pacific Northwest. Just what is a timber frame house? Essentially, timber framing is a method of post-and-beam construction in which the frame of the structure is made of large-dimension lumber and braces, usually with intricately interlocked joints and wood fasteners such as pegs. Timber frame homes are more costly to build than conventional homes, because of the labor intensive nature of frame joinery and the expense of the wood. A home can be completely built using timber framing, but “hybrid” building techniques are most commonly used in timber frame homes built today. These hybrids use conventional stick built methods for the portions of the house where the framing isn’t visible. The hybrids can include homes that have single rooms with full timber framing or with rooms whose roof trusses are supported by conventional wooden stud walls. 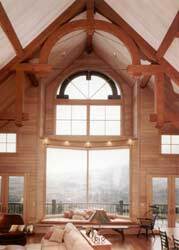 In all cases, frame components are custom-made by San Juan Timberwrights for each home. They are constructed at the workshop, then dismantled and transported to the building site, where they are carefully reassembled. To build these frames, the company’s Arboles workshop and lumber yard includes band saws and planers to straighten and remove damaged surfaces before timbers are hand-shaped into the beams and posts. Some customers prefer to have the surfaces of their timber left “as is.” Two large workshops (one covered with a wonderful hodgepodge of old siding) provide all the room that’s necessary to construct the frames for any home. San Juan Timberwrights also creates cabinets, flooring, doors and trim from the same recycled wood. 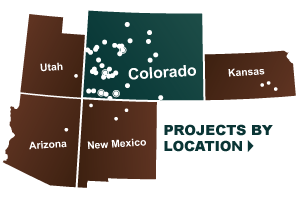 San Juan Timberwrights is a member of the Timber Framers Guild of North America, the Timber Framers Business Council, and the Home Builders Association of Southwest Colorado. Rita is an environmental scientist, textile artist and aspiring writer of children’s fiction, poetry and essays on rural mountain life and reflections on the spirit. She loves clear air, tall trees, chocolate and laughter with friends. Excellent web design, makes my eyes happy !